Open to players from 8-16 years of all standards. We combine fun, social and a thoughtfully structured coaching program to ensure maximum progression and learning for all involved. Our coaches have been running these sessions as a team for many years and continue to work together to improve and evolve the camps. 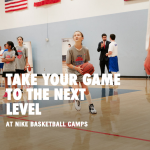 The Nike Basketball Camps offer camps nationwide for both boys and girls. Whether you are a newcomer to the sport or a varsity level player, the Nike Camps are designed to help young basketball players develop athletically. International campers, we have multi-week and language programs too! 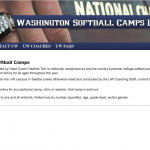 The Husky softball program led by Head Coach Heather Tarr is nationally recognized as one the country’s premier college softball programs. We offer high energy skills development camps and clinics for all ages throughout the year.